When Little Miss I became a preschooler, she was always soaking up everything around her like a sponge. Her mind was constantly spinning, which made winding down for the night a bit of a challenge. She didn’t want to miss a single second! My husband is like that, so he understood her problem just too well. I’ve never had a problem falling asleep (a fact that has always frustrated my dear restless hubby), but I had never been able to stop my mind from racing at all times either — the difference with my better half is that I consider dreaming is a very important part of having a healthy imagination! In any case, when I started doing yoga and meditation, I finally learned to put my mind at rest. So, after having that work for me, I decided to give it a try with Little Miss I and see if it would give her the tools to wind down and relax too. At the time I had Gaiamtv.com, which has a wide variety of yoga classes and meditation series. However, their yoga for kids classes were OK, but not amazing. I didn’t want to take her to a formal class, as there was no way she could stand a yoga class for an hour… and anything less than that was a waste of time-money. So, I started surfing youtube for different options. After a couple of tries, we came across the most fun, energetic and imaginative yoga class for children: Cosmic Kids. 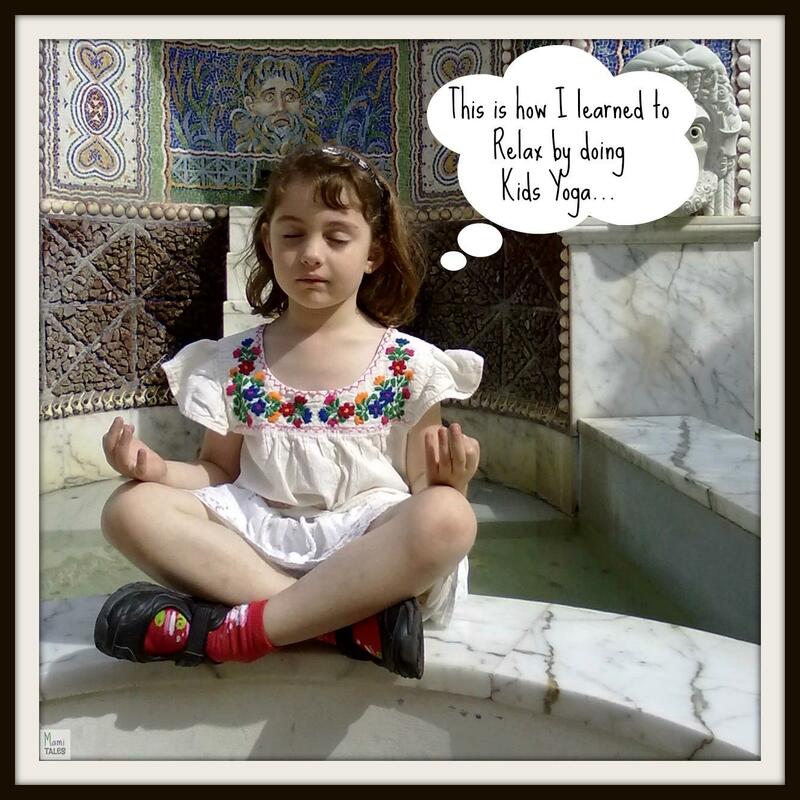 Cosmic Kids was a free youtube channel with a couple of yoga stories performed by Jaime, a British yoga teacher and storyteller with a fabulous understanding of children’s psyche. Her classes are short stories that she performs using diverse yoga poses, and the kids follow her along diving entirely in her fantasy world. According to their website, Jaime started teaching yoga to kids in 2009, then in 2012 her now husband, Martin, decided to record her classes and put them up on youtube. Thus Cosmic Kids was born. In May 2012 the channel was up and running with a couple of stories, and nowadays they’ve accumulated several more adventures. My daughter can go from one clip to the next non-stop… and she can then get her one hour of yoga no problem! Currently Jaime also has a meditation area called Zen Den, where she gives kids tools and ideas on how to use their breathing to calm down and solve anxiety and problems. First of all, we play music for her, as part of her bedtime routine. Over the years we’ve perfected the sleeping playlist, adding things that are soft and soothing to her. Then, using the techniques that she’s learned from Cosmic Kids, plus my own combination of Shavasna and Yoga Nidra guided relaxation, now she closes her eyes and I ask her to picture a point of light right between her brows. I give her the color of this light, sometimes white, sometimes blue or green, then I tell her to picture that dot growing bigger and bigger and filling her whole body. Whatever the light touches, that part of her body becomes heavy and sinks into the mattress. By the time I am down to her toes, she is practically snoring. After we’ve been doing this method for quite some time, now I just guide the point of light with a touch of my finger without saying anything, and the result is the same: a deeply asleep child in 5 minutes. I am so glad to have found a free option to get my child exited about yoga for kids, as I think it is a wonderful way to exercise both body and mind. Namaste! Tagged Family, Healthy kids, Reviews, Sleeeping. One of my kids really enjoys yoga. In her choir class at school, they do “yoga fridays” to end the week on a relaxing note. The kids love it! Let me know how your child likes Cosmic Kids! It really is a lot of fun. Great article and superb idea for that sleep routine. I myself am a certified Cosmic Kids Yoga teacher and really fond of Jamie and all she does. I was wondering if you would like to share (some of) the tracks of the sleepung playlist? Isis, thanks so much for reading it! And congratulations on being a Cosmic Kids Instructor! It really is an amazing way to teach kids yoga. About the playlist, it has been tailor made for my daughter, taken in consideration her tastes and what relaxes her. It is profoundly eclectic, and it includes the Gaelic song from Brave (the movie); Ederlezi (by Goran Bregovic, soundtrack for Gypsy times); Vuelie (the beginning song from Frozen); Oran Na Maighdean Mara, from Hector Zazou’s Songs from the Cold Seas; Rachmaninov’s Piano Concerto n.2 adagio; Elgar’s Violin Concerto, The Lark Ascending; The Country Lasse, by the Toronto Consort; and Julie Andrew’s Stay awake, from Mary Poppins. So, as you can see, it is the strangest list, but perfect for her 🙂 Hope it helps! Your are very sweet, thanks! I think the most important thing is to be sensitive to what they need 🙂 Yoga is great in that respect, as it helps us listen to our body… and to other people’s bodies too!